Dwight Hamilton sits at his desk. Hamilton took over as Northwestern's new associate vice president of equity on July 1. When Dwight Hamilton, the former vice president of inclusion, diversity and equity at Smith College, heard from a Northwestern job recruiter in late January, he didn’t consider himself on the market. 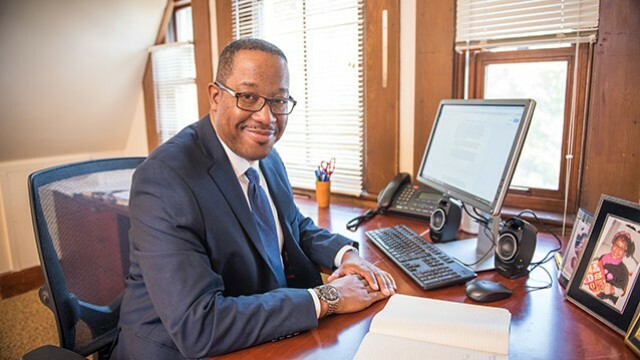 The commitment he saw from the University to diversity and inclusion, however, as well as the opportunity to return to the Midwest attracted him to the position, Hamilton said. Hamilton joined Northwestern on July 1 as the University’s inaugural associate vice president of equity. Responsible for combining and leading the Sexual Harassment Prevention Office and Office of Equal Opportunity and Access, Hamilton oversees claims of sexual harassment, Title IX matters and employment-related harassment and discrimination, among other issues. Entering his eighth year in higher education, Hamilton called his new position a “continuation” of his previous work. During his time at Smith, he was responsible for creating and leading the Office of Diversity, Inclusion and Equity and guiding the development of related initiatives and programming. “My focus there was really pulling the college out of a diversity mindset, where we looked at just at representation of difference, and pulling it more into being inclusive — which is making those differences relevant for that institution and creating an environment where individuals, regardless of their identities, could experience and enjoy full participation,” Hamilton said. While at Smith, Hamilton served on the college’s Inclusion Council, a group comprised of faculty, staff and students that deals with diversity and equity-related concerns and, in 2016, oversaw a campus-wide climate survey. Laura Rauscher, Smith’s director of disability services and a member of the Inclusion Council, said she met regularly with Hamilton to talk about accessibility, inclusion and the intersections of those issues with other diversity matters. Throughout her conversations with Hamilton, Rauscher said his thoughtfulness stood out as he balanced leadership with listening and giving others a platform to speak. Because Smith is a small college with under 3,000 undergraduate students, Rauscher said the Office of Diversity, Inclusion and Equity has “always struggled” with building up a staff. When Hamilton came to Smith, he hired a Title IX coordinator and, later, an administrative assistant. Rauscher said one of Hamilton’s strongest qualities is his ability to communicate with others in both team settings and individual collaborations and then work to take action in response. Hamilton also worked to institute training in assembling diverse hiring pools for faculty, Smith College President Kathleen McCartney said in an email to The Daily. McCartney called Hamilton a “key advisor and counsel” and said he partnered with her in offering innovation grants to students, faculty and staff in order to foster ideas for advancing equity and inclusion. However, his position at Northwestern, Hamilton said, deals less with diversity and inclusion and more so with another area he has extensive experience in — Title IX. Before drafting Smith’s gender-based sexual misconduct policy, Hamilton worked as the Title IX coordinator at Grand Valley State University — a larger institution of about 22,000 undergraduate students — and handled policy drafting and case supervision. After going through NU’s 2015 Campus Climate Survey on Sexual Misconduct, Hamilton said he believes greater outreach is “key,” as only 54 percent of respondents were “at least slightly aware” of the Sexual Harassment Prevention Office as a resource for those who’ve experienced sexual misconduct. Additionally, only 7 percent of those in the survey who indicated they had experienced sexual misconduct said they formally reported the incident, a figure Hamilton said he hopes to improve. As he’s worked at various colleges and universities, Hamilton said he has seen a steady increase in the number of reports of sexual misconduct at each institution. He said the goal isn’t for all complaints to end up as formal conduct procedures, but rather for students to have an opportunity to be connected with resources and receive support. Though different dynamics may exist in his work — since Northwestern, unlike Smith, is co-ed — many of the same issues exist in both settings, Hamilton said. At Northwestern, Hamilton has been immediately tasked with finding a new Title IX coordinator after this summer’s departure of longtime coordinator Joan Slavin. University spokesman Al Cubbage said Friday that Hamilton will lead the search for a replacement while Amanda DaSilva serves as interim coordinator. Another change for Hamilton is the presence of Greek life. Smith does not have a Greek system, and only 8 percent of Grand Valley State students are involved — a sharp disparity from the 38 percent involved at Northwestern. After applying for the Northwestern position, Hamilton said he followed the development and eventual announcement that disciplinary action would not be taken against Sigma Alpha Epsilon and another unnamed fraternity regarding reports of druggings and multiple alleged sexual assaults at the two houses earlier this year. Hamilton said the extent of his knowledge, however, is limited to what he’s read about the development. As he begins his tenure, Hamilton said he’s working to get a sense of where Greek organizations and the student body as a whole stand in terms of education and prevention. In working with Greek communities at other institutions, Hamilton said he’s seen barriers arise at times for those affected by sexual misconduct and, as a result, plans to be “very intentional” in reaching out to Greek organizations, as well as other student groups, to determine what obstacles do exist. This story was updated at 6:30 p.m. with new information that Hamilton will lead the search for a new Title IX coordinator at Northwestern.